I haven’t made any sewing advances to show off, so today seems to be the ideal time to give two summer book shout outs. 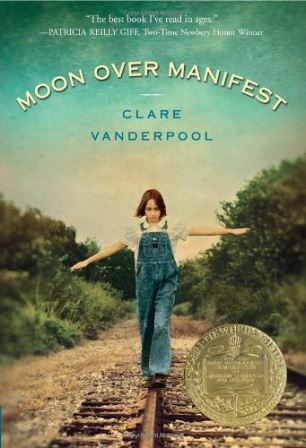 My first shout out goes to the children’s book Moon Over Manifest by Clare Vanderpool. Vanderpool won the 2011 Newbery Medal with this work, and it was an award well received. The prose was stunning; as a word lover, I was salivating over Vanderpool’s literary cadence and pleasantly surprised at the range of vocabulary that she used — some of it sweetly Southern. If I ever have kiddos someday, this book is going to rank right up with Anne of Green Gables as a tool to ingrain them with words that we don’t use often enough anymore. As beautiful as the prose was, the story was equally if not more so. Vanderpool weaves a tale of regrets and acceptance and what we suffer when we can’t find the secure love that we want more than anything else in the whole world. I listened to the book in audio version from my library, and the narrator did a phenomenal job bringing the story to life, so I’d recommend listening to it if you don’t have time to read it. I just put Vanderpool’s more recent novel Navigating Early on my book wish list, and I’m looking forward to reading more from her. 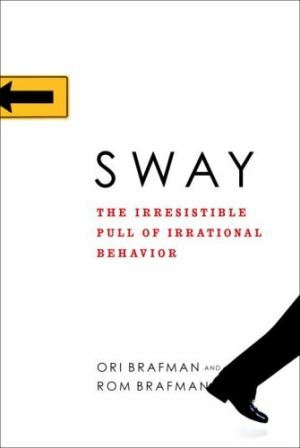 My other shout out goes to Sway: The Irresistible Pull of Irrational Behavior by Ori Brafman and Rom Brafman. I scored it used on my trip to Nashville and then realized the library had the audio version, so I downloaded that and got to quilting and furniture painting with the hard copy nearby in case I wanted to highlight anything. If you’re only interested in reading one book about how we make decisions, I’d still direct you to How We Decide by Jonah Lehrer, but Sway was worth reading as well, and it’s a pretty short read. The book has no biblical underpinnings, but as I was listening, I found myself pondering the meaning of Mathew 6:24: “No one can serve two masters. Either you will hate the one and love the other, or you will be devoted to the one and despise the other. You cannot serve both God and money.” Brafman and Brafman take readers to Switzerland in 1993 when the government was trying to identify a town that was willing to become a nuclear waste repository. The first town hall meeting held near the site of the proposed repository consisted of merely informing the townspeople about the proposal and the government’s backing of it. The residents were asked if they would agree to allow their town to become a repository for nuclear waste, and 50.8 percent responded that they would be willing — possibly as an act of goodwill towards their native home. Now, I think 50.8% is a pretty high number considering that nuclear waste was at stake. Obviously though that leaves about 50% of the population as unhappy campers, so researchers descended on the community to see if they could convince more residents to let the town be used as a nuclear waste repository. They thought that offering individuals the equivalent of about $2,175 a year would increase public support. It didn’t. Now, only 24.6% of residents approved. As I reflect on Matthew 6, I know that there are many people who give to others without any commitment to God motivating them, but for those who do serve because they believe that God has commissioned them to do so, I think these studies are fascinating. I’d always just thought that trying to serve money would distract me from serving God, hence the biblical warning against it. It turns out that it seems this dichotomy is hard wired into my brain. I can’t have a dual focus to my intents, and since serving people is tough — very tough as I’ve discovered while trying to help someone get back on her feet over the past couple of weeks — I think it was nice of God to design the part of the brain that responds to altruistic acts to be more sensitive to stimuli. A little service appears to go a long way. This entry was posted in social justice, what I'm reading and tagged reading, social justice. Bookmark the permalink.